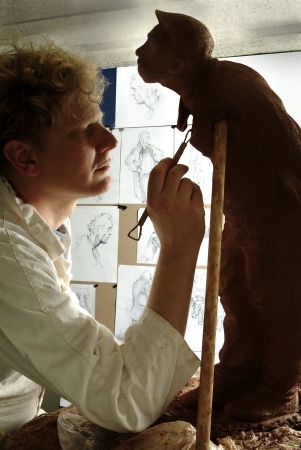 Marcus Cornish’s passion for sculpture began at the age of ten when he was first introduced to the Sculpture Courts of the Victoria & Albert Museum. In time he gained a first class honours degree in Sculpture from Camberwell School of Art followed by an MA from the Royal College of Art. In 1993 Marcus Cornish was elected a member of the Royal Society of British Sculptors. His focused interest in sculpture has been enriched and extended by many diverse and challenging artistic opportunities in the form of scholarships, artist-in-residencies and as an official tour artist. Cornish won a scholarship to India to study the work of Ayanar Potter Priests and Henry Moore scholarships to pursue ceramic art. He was artist-in-residence at the Museum of London in 2005 – 2006 and at an Ibstock brick factory for a year. He was also invited to be official tour artist on a diplomatic tour to Eastern Europe with HRH The Prince of Wales and as tour artist with the British Army in Kosovo. Cornish’s work has been recognised in a number of awards both nationally and internationally and covered in The Times, Independent and Sculpture Magazines. He was the youngest sculptor at the time to win every sculpture prize at the Royal Academy Summer Show.